Welcome to the RFduino and mobile application resource section. In this section, you will find various resources to get started developing mobile applications to interact with your RFduino projects using Evothings Studio. RFduino manufactures an extensive line of fully integrated, high quality, high performance, configurable Wireless RF Transmitter, Receiver & Transceiver Modules, suitable for nearly every type of application. 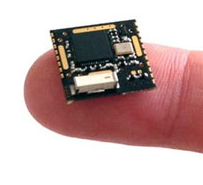 The RFduino (pictured right) is the worlds first wireless coin-sized Arduino compatible open-source micro-computer that can talk to a mobile device using Bluetooth Smart (BLE). Below are a number of resources on our website to support getting started with developing mobile apps using Evothings Studio. Enjoy discovering a new world of possibilities combining your RFduino projects and mobile applications!